Training modules that take real world scenarios like marketing analytics or inventory supply chain to introduce intermediate and advanced wrangling concepts. Challenges aimed to test your ability to solve difficult wrangling challenges. Complete at least two training scenarios. These training scenarios are intermediate and advanced concepts delivered through real world scenarios. Challenges are short, 3 – 10 step challenges to complete a certain data wrangling task. These challenges will test intermediate and advanced topics covered in training. Submit answers of these challenges to customersuccess@trifacta.com. More details on submitting these answers can be found in the challenges themselves. 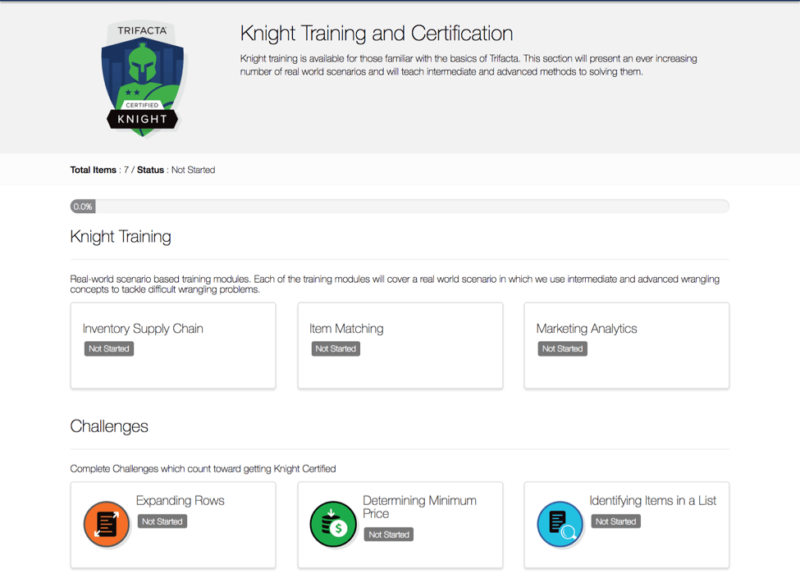 The way we have organized Knight Training and Certification allows us to continuously add to our collection of training scenarios and challenges, so even after completing the Knight certification, there will still be plenty of new concepts to learn and challenges to complete. There are more levels to come in our journey to mastering Trifacta, so stay tuned!